This sterling silver Celtic wedding band features a continuously embossed design that is inspired by the famous Ardagh Chalice. 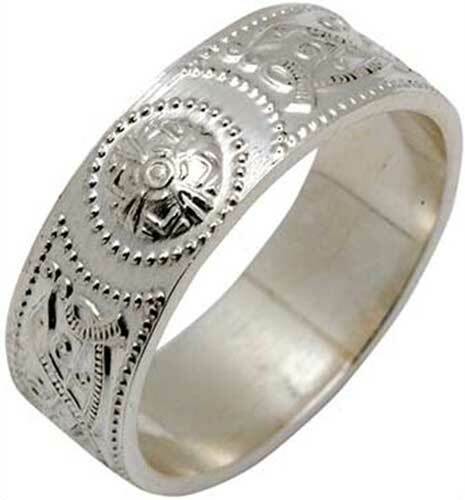 The Celtic warrior shield wedding ring measures approximately 6 mm wide and it is a suitable size band for a man. The Celtic warrior shield band is made by TJH in Dublin, Ireland and it is gift boxed with a Celtic knot history card, complements of The Irish Gift House. The Warrior Shield Celtic Band is inspired from the design of the Ardagh Chalice, which ranks with the Book of Kells as one of the finest known works of Celtic art. The Ardagh Chalice is thought to have been made in the 9th century AD and it is a large, two-handled silver cup, decorated with gold and gilt bronze along with brass, lead pewter and enamel; it is assembled from 354 separate pieces. The names of the apostles are incised in a frieze around the bowl and below is a girdle bearing inset gold wirework panels of animals and birds along with geometric interlace. Techniques used include hammering and engraving along with lost-wax casting, filigree appliqué, cloisonné, and enameling. The Ardagh Chalice was found in 1868, together with a small bronze cup and four brooches, by two boys, Jim Quin and Paddy Flanagan, digging in a potato field on the south-western side of a rath (ring fort) called Reerasta, beside the village of Ardagh, County Limerick, Ireland. It currently resides in the National Museum of Ireland.